Stephen Curry of the Golden State Warriors warms up prior to the start of Game Two of the Western Conference Semifinals of the NBA Playoffs against the Memphis Grizzlies at ORACLE Arena on May 5, 2015 in Oakland, California. Up until his Golden State Warriors failed to mount a second-half comeback against the Memphis Grizzlies on Tuesday night, it had been a great week for Stephen Curry. Late Sunday, word leaked out that the Warriors’ guard would be named MVP for the 2014-15 NBA season, and Curry accepted the hardware Monday. Curry’s chief rival for the award, Houston’s James Harden, was reportedly disappointed over the outcome of the voting. It’s a completely understandable reaction: The best advanced metrics had Curry and Harden neck-and-neck in the MVP race for most of the season, so Curry’s big edge in first-place votes likely owes more to the Warriors’ incredible team record than any real difference between the two players. In fact, according to our wins above replacement (WAR) metric, Harden slightly edged Curry in value, 16.8 to 16.6. The truth is, we’ll never know which player really deserved the award … in part because a phrase like “most valuable” is very hard to quantify. Metrics are imperfect, probably to a much greater degree than any stathead would like to think. But one thing we can do to combat a false sense of certainty is assign probabilities to each player’s case for adding the most value. 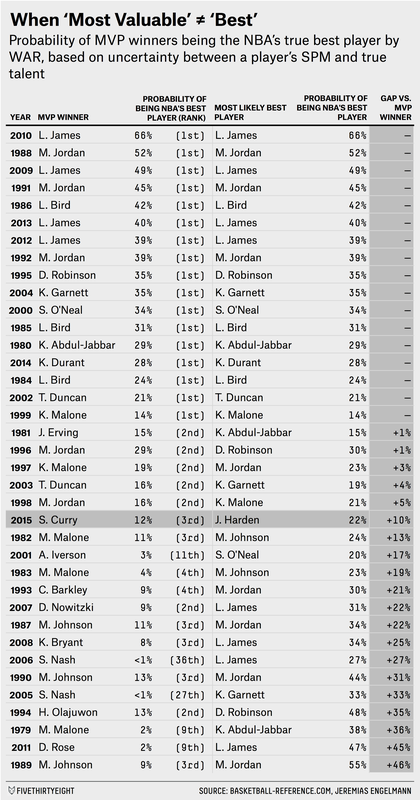 Along the way, we can also compare the results to past MVP races — for instance, how did Curry-over-Harden compare to other MVP decisions in history? To measure the uncertainty between a player’s measured WAR and his actual “talent” — that is, the number of WAR he would earn if we were omniscient and knew the exact contributions of every NBA player — we can look at the confidence interval around a player’s measured value.1 In turn, those confidence intervals can tell us the probability that a player was truly the most valuable (by WAR) in a given season. This year, Harden was the most likely “true” WAR leader — but with a mere 22 percent probability of being the best. In the past 37 NBA seasons,2 this year is the seventh most uncertain in terms of whether a WAR leader was actually the league’s true most valuable player. Meanwhile, Curry came in third this season with a 12 percent probability of being the true best player in the league (the Clippers’ Chris Paul was sandwiched between Harden and Curry at 19 percent). In some ways, 12 percent is very low probability. Since 1978-79, only 12 players have won the award with less certainty that they actually produced the league’s greatest value. But the 2014-15 season also featured an unusually wide-open MVP race. Kevin Durant, last year’s winner and the presumptive favorite going into this season, missed 55 games with injuries and only recorded 4.5 WAR. And LeBron James, who’d been projected as the league’s best player on a per-minute basis every season between 2005-06 and 2013-14, produced his lowest WAR (13.1) since his rookie season — yet still had a 9 percent probability of being the true best player in the NBA. And that’s without even getting into the cases to be made for Russell Westbrook (9 percent probability of being the best) or Anthony Davis (4 percent). By that standard, Curry’s win was a far cry from past miscarriages of MVP justice, such as Michael Jordan losing out to Magic Johnson in 1988-89 despite Jordan having a 55 percent probability of being the league’s true best player — the second-highest “best player” certainty of any season since 1978-79, trailing only James’s 66 percent mark in 2009-10. Conversely, there was no such certainty in a season like 2014-15, where several of the usual MVP suspects were absent from the front of the race. In such a situation, you can’t really go wrong (or, perhaps, you can’t really go right) no matter which MVP you choose. In this case, since we need to use Statistical Plus/Minus (SPM) for historical seasons, I looked at the standard error between a player’s multi-year projected SPM talent and his Real Plus/Minus (RPM), a new metric that melds a player’s boxscore stats with his on-court influence over the team’s scoring margin. I then combined that with the standard error between RPM and “true talent” to estimate the probability that any given player had the league’s true best WAR in a given season. The 1978-79 season is the earliest for which this calculation can be run.